He’s loved by many, but loathed by more. And the pressure is on for him to boost his ratings this year. So what have Sanma’s producers cooked up for a ratings winner this summer? Well, viewers are going to get the chance to physically assault Acacia Sanma on live television. Those interested will be able to enter a lottery simply by sending a postcard to Fuji TV. Then one lucky winner will be chosen to lay one on the bleached-buck-toothed entertainer. 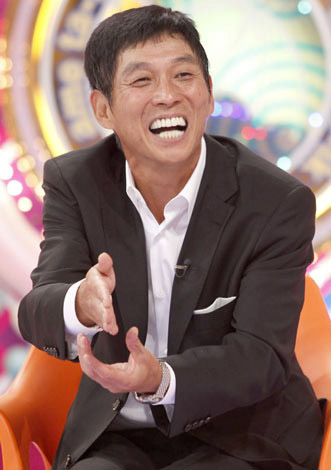 According to sources within Fuji TV, Sanma was originally cold on the idea of being assaulted. Says one staff member, “He couldn’t be persuaded to agree to the project. We told him that everyone would want to watch, both his fans and his haters. But no matter how many different ways we tried to explain the likely ratings bonanza, Sanma just couldn’t grasp how he could get more viewers simply by being punched. Executives had to break it down by using diagrams, charts and even kiddie building blocks. In the end, the awakening moment was like the sound of a thousand ball-bearings dropping from a thousand pachinko machines, all hitting the jackpot simultaneously. He got really excited and then repeated everything that we had been telling him, as though it was his idea.